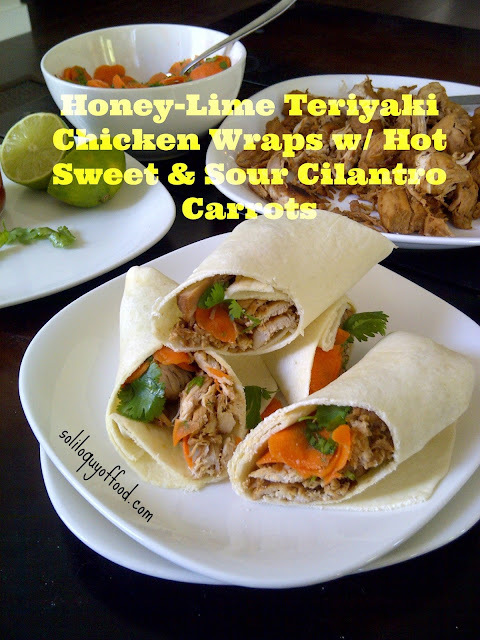 Honey Lime Teriyaki Chicken Wraps with Hot Sweet & Sour Cilantro Carrots. Yeah, that's a loooong title. I'm not sure what exactly constitutes an actual Teriyaki sauce? Soy sauce, sweetened with honey and a twist of lime? Why don't we just call this Teriyaki sauce? Whenever S and I are unsure about something, we quote the little boy I use to babysit. We took him swimming one time at the local beach. The beach in northern Maine was located on the bank of the Penobscot River (East Branch). The current is very calm here, nothing like the white water rafting currents located about an hour north. B was only 4 or 5 at the time; not an experienced swimmer. Perhaps the current, or just the act of swimming proved too overwhelming for him, but he didn't want to miss out on the fun. As S, B's brother and sister, and I waded in, B stood on the shore ankle-deep in the water. He started kicking and jovially splashing about, then he turned toward me, mater-of-factly, and said,"Kim, why don't we just call this swimming?" I.almost.died.laughing. From that moment on, anytime we're in a conundrum, S and I embrace B's attitude and say: "Why don't we just call this__________________?" Surely the legitimacy of my Teriyaki is no major conundrum, but B's philosophy is applied here, So, why don't we just call this Teriyaki sauce? Moving on! The carrots are adapted from a carrot slaw recipe that is one of our faves. I opted to slice them into super thin rounds, as grating sometimes pulverizes them too much. I didn't want the excess liquid from grated carrots seeping through the wraps either. If you have a food processor with a fine, thin slice setting then you can use that; I used a carrot peeler. The chicken and carrots can be made ahead, then just assemble the wraps when ready to eat. 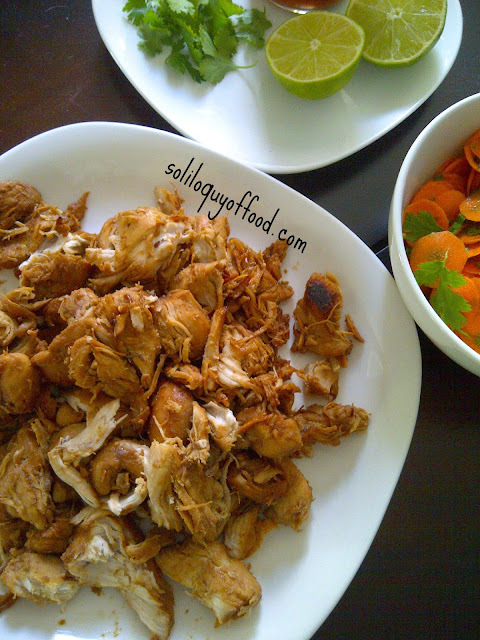 The salty-sweet and limey chicken - combined with the hot, sweet and sour cilantro carrots - is an explosion of flavors. Why don't we just call this a wicked good wrap? Combine soy sauce, honey and juice from one lime; stir well to dissolve the honey. Pour marinade into a large Ziploc bag; add the chicken to the bag. Press out as much air as possible and seal the bag. Once sealed, roll the chicken around in the marinade to evenly coat each piece. Lay the bag down flat, on a large tray to catch any leakage, and refrigerate for 2 hours - flipping the bag over half way through to evenly distribute the marinade on all sides of the chicken. Heat a large skillet over medium-high heat. Pour chicken and marinade into hot pan. Bring to boil, cover partially reduce to a low simmer and cook until most of the liquids have evaporated and the chicken browns and begins to easily pull apart (about 20-25 mins). Squeeze in the juice of 1 lime to deglaze the pot. Stir for a few seconds to release any browned bits from the bottom of the pan. Remove the pan from the heat and break up the chicken into small pieces with the back of a large spoon. Cover to keep warm, set aside. While the chicken is simmering, peel the carrots and chop off the tops. With a vegetable peeler slice across the widest end of the carrot making thin round carrot slices. You'll need about 2 cups worth of thinly sliced carrot rounds. 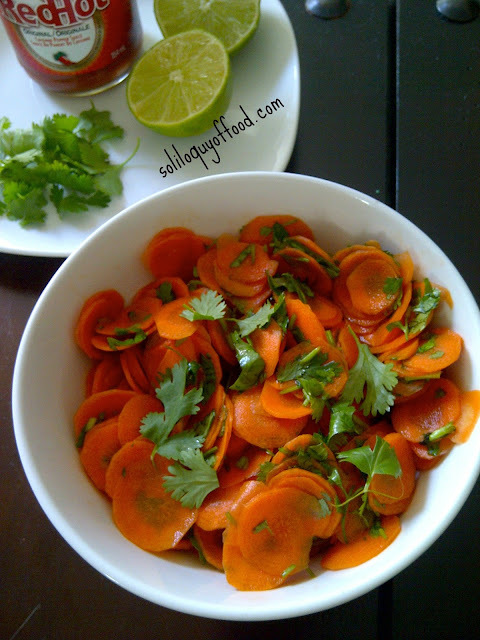 Toss carrot slices with lime juice, sugar and hot sauce. Stir in cilantro leaves, toss to coat. Divide the chicken evenly into 10 servings, about 1/4 cup of chicken per wrap. Divide carrots into 10 servings, about 3 TBS of carrots per wrap. 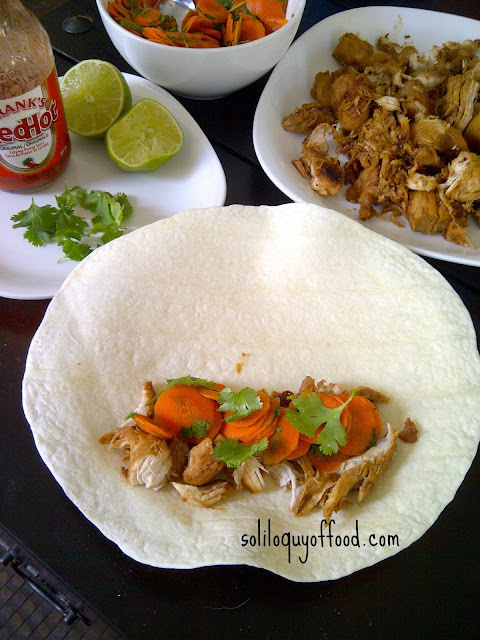 Arrange the chicken and carrots in a strip in the lower third of the wrap - the part of the wrap closest to you. Top with an additional TBS of cilantro leaves. Tightly roll the end of the wrap over the filling, toward the center if the wrap, stopping in the middle. Fold each side in towards the center to seal the ends, and continue rolling. Place seam-side down and cut in half. Serve with lime wedges and hot sauce. Hi Kim! Wow, these wraps look delish!! Thanks so much for stopping by my page! Love making new blogger friends. :) I'm a new FB and Pinterest fan of yours as well! Thanks for returning the blog-love! Have a great weekend!! Hello: Found your page on Cooking with Curl linky party. Your chicken wraps and carrots look and sound oh-so-delicious. Thanks for the pin-luv Marlene! 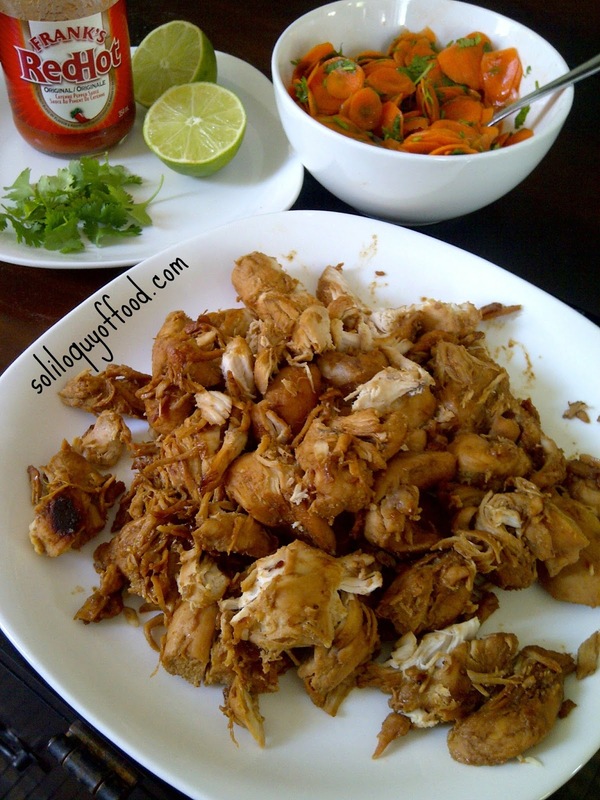 Mention chicken and I get excited!Then look at all the wonderful ingredients in this recipe. It looks so delicious. Thanks for the pin, Kristen! Hi Kim, this recipe looks so good. I hope you enjoyed your 4th of July weekend. This sounds wonderful! This sounds like something right up our alley! I am a wrap fan for sure! Sounds tasty! Thanks for sharing at Sweet & Savory Saturdays #20! Thanks Becca! Dey wuz goooood! This looks amazing.... Found you at Tuesday's Table. Thanks Nici! I was JUST drooling over your blueberry crumb cake!! These look great, Kim! I love they honey lime teriyaki sauce! Delish! Pinning and sharing on Facebook and Twitter. Thanks for sharing at Marvelous Mondays! Thanks Julie :) I appreciate the social shares!! I dig that much of the work can be done ahead of time. Gotta love that on a busy night. Super cute story! Thank you for sharing with See Ya in the Gumbo. Yes! The Dude-Seal of Approval!! I'm glad you all enjoyed it; I've also had the chicken and carrots over soba noodles. It's just a great combo anyhow you make it :) we think, anyway. Kim, these sound absolutely delicious! :) Thank you so much for linking up with me this week at Tasty Tuesdays! I’ve pinned this & shared it with my followers! Please be sure to stop back by the party and check out some of the other links! Kim, these look so tasty! Wishing I had one for lunch today. Featured at this week's Wicked Good Wednesdays. Thanks for sharing!